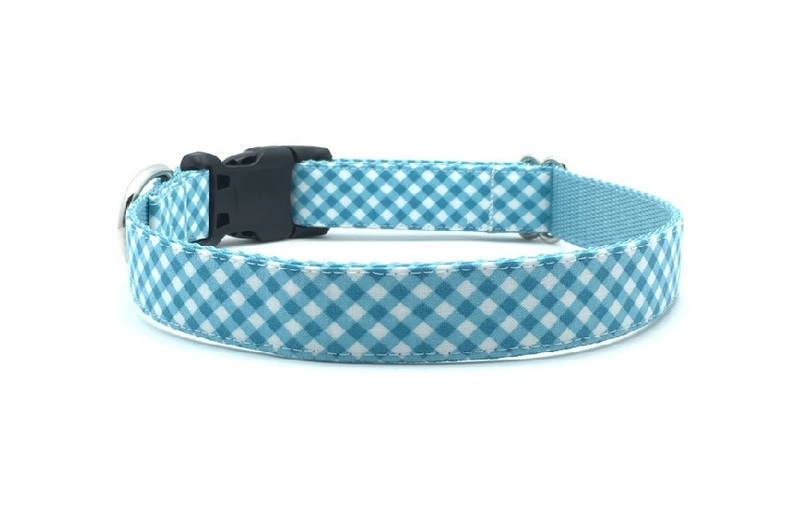 This sky blue gingham print is as cheerful as a summer breeze! Small (3/4” wide) - Adjusts 9-12"
Medium (3/4” wide) - Adjusts 11-18"
Large (1” wide) - Adjusts 12-20"
XL (1” wide) - Adjusts 14-22"
XXL (1” wide) - Adjusts 15-25"
This adjustable buckle collar features designer cotton fabric stitched to heavy-duty nylon webbing, curved side-release buckle, heavy-duty welded nickel D ring for attaching tags and a leash, and is triple stitched at stress points for strength and durability. This design is also available in a leash and bow tie (sold separately). All pieces are created by hand, so no two items are identical. Please allow for variances in pattern placement as shown in the photo, depending on length/width of your item. Please review shop policies before making your purchase. Return/Exchange Eligibility Category: STANDARD ITEM. Please DO NOT place an order in the comments section of this post. Please visit the ORDER PAGE for instructions. For a list of upcoming shows or markets, click on the SHOW SCHEDULE page. Would you like to be notified when new items are added? Click on SUBSCRIBE in the top right corner. Do you have Cute! Pet Gear Rewards Points? Click on the ORDER page for details.